Those well ingrained in the underground power metal scene probably know guitarist Jason Ashcraft for his work in Helion Prime and vocalist John Yelland for his other act Judicator. Dire Peril is another outlet for both to channel different power influences, coming together on this debut full-length The Extraterrestrial Compendium. The band has been going since 2012, releasing a series of EP’s with previous vocalist Normal Skinner (Niviane) before John joined in 2015 and they’ve been establishing themselves with singles and tours supporting Sirenia and Seven Kingdoms. This release therefore contains a bit of the old and the new, spanning twelve songs and over 65 minutes of music to consume – but should prove quite tasty and thunderous for those who love the genre’s heavier angles. The musical side emphasizes crunchy, tight triplets and heads down power – building up twin harmony moments throughout, and occasionally delivering that acoustic/clean twist when called for as a dynamic contrast. Many will be thinking of classic Iced Earth, Iron Savior, and Demons & Wizards when “Planet Preservation” and “Total Recall” burst through your speakers – guest drummer Justin Tvetan supplying the steady double kick/snare charge with exciting fills to hold down the percussion fort. Britney Slayes (Unleash the Archers) trades verses and lends choir charm to John’s voice for “Queen of the Galaxy”, a fairly straightforward uplifting anthem with that European charm as Jason throws about quick hitting guitar melodies that raise the charge into battle. The thrash side comes out on “Roughnecks”, where John chooses to accelerate into falsetto highs that take his Hansi/Blind Guardian-ish voice into more Piet/Iron Savior territory. Dire Peril mix up shorter songs with the occasional epic offering, where the 9:34 closer “Journey Beyond the Stars” includes orchestration/string help from Austin Bentley and a guest solo/vocal spot from Ayreon/ Star One main man Arjen Anthony Lucassen – a moody, progressive offering that starts relatively somber before picking up a heavier Metallica/Iced Earth vibe and then transitioning again into the piano calmness for its conclusion. 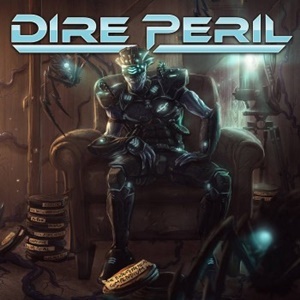 In a marketplace where musicians often need to keep multiple bands/projects going to make ends meets financially and creatively, Dire Peril proves that a heavier power metal sound can be quite endearing – especially for those who miss early/mid 90’s Iced Earth and Iron Savior.